The top locals at the Great Eastern Run, Philippa Taylor (left) and Aaron Scott. Photo: David Lowndes. Nene Valley Harrier Philippa Taylor maintained her perfect record at the Great Eastern Run in satisfying style. The first lady of local long distance running is a regular at the popular half marathon and has yet to be beaten in her age group or by any other local female athlete. But the latest performance was one of the more satisfying for the Stamford-based athlete. “I’ve had a lot of calf problems in the last 12 months,” Philippa said. “So I’ve not been able to train as hard as I would have liked. “I’m very pleased therefore to have run this well and I’m delighted to have maintained my unbeaten record in mny age group and against local runners. I think I’ve done six or seven Great Eastern Runs in a row now. 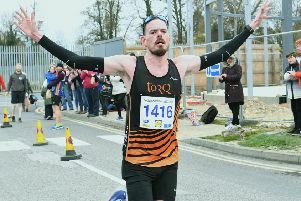 The first local man home is also Stamford-based and Aaron Scott, who runs for Lincoln Wellingtohn AC, but is a second-claim runner for Nene Valley Harriers, was dreaming of race glory for about a mile! “I was actually leading for a about a mile,” Scott said. “The Kenyans started off quite sluggish, but they sooon joined me and from about 5K they pulled clear and I never saw them again. “I actually raced a 6k yesterday in the club relays event so my legs were a bit tired, but the main thing for me was getting some work in ahead of a marathon I’m doing in a few weeks.